Lt. Gen. James McLaughlin serves as deputy commander of the U.S. Cyber Command. 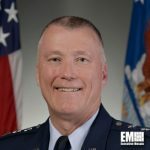 The 33-year Air Force veteran oversees and coordinates cyber defense programs and missions for computer network infrastructures across the Defense Department. Prior to his current role, McLaughlin was commander of the Air Forces Cyber and 24th Air Force. He also served as deputy director of global operations at the U.S. Strategic Command, director of planning and preparation at the office of defense undersecretary for intelligence and senior adviser on space, intelligence and C4ISR for defense undersecretary for policy. McLaughlin has received numerous awards, including the Humanitarian Service Medal, Air Force Achievement Medal and the Defense Superior Service Medal with two oak leaf clusters. He holds a bachelor’s degree in general studies from the U.S. Air Force Academy and master’s degree in space systems management from Webster University.